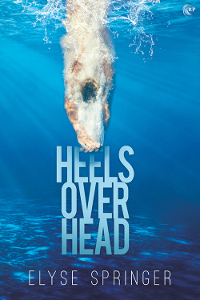 Hello, and welcome to the blog tour for Heels Over Head, my new sports romance where Olympic diving hopefuls battle it out on the platform… while discovering friendship, family, and love along the way. I hope you enjoy reading Jeremy and Brandon’s romance as much as I enjoyed writing it! I’ll be stopping on several blogs throughout the week, so I hope you’ll follow along and join in the discussion. Plus, don’t forget to leave a comment at the end of the post… you’ll be entered to win an Amazon gift card! To celebrate the release of Heels Over Head, one lucky winner will receive a $10 Amazon gift card! Leave a comment with your contact info to enter the contest. Entries close at midnight, Eastern time, on June 3, 2017. Contest is NOT restricted to U.S. entries. Thanks for following the tour, and don’t forget to leave your contact info! Congratulations with this release, El. I already have it lined-up on my TBR.